Maybe you never played the original Highway to the Reich or maybe you already played it to death. 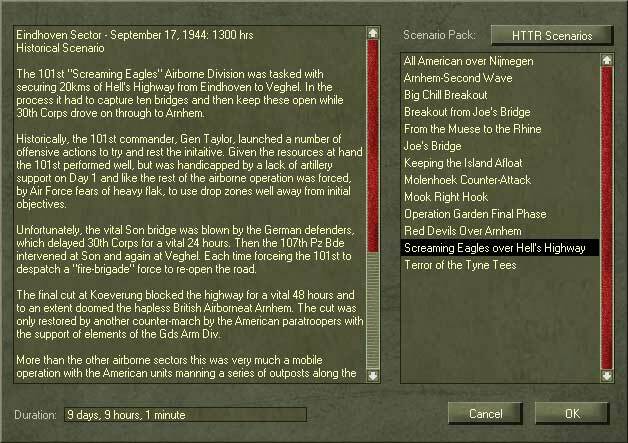 Either way, here are ten reasons to get back into Market Garden with the latest Panther Games engine. If you have played Conquest of the Aegean, you will know all of these but nonetheless it's worth to recount what's new since the original Highway to the Reich. 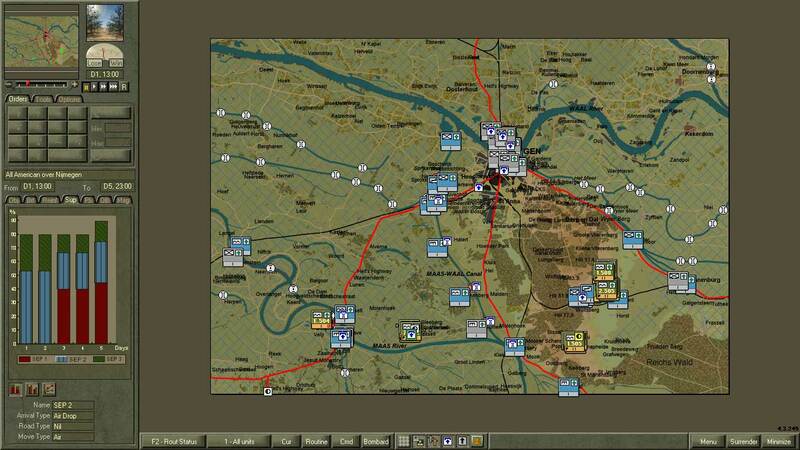 This is the most original and detailed depiction of command in any commercially available war game out there. 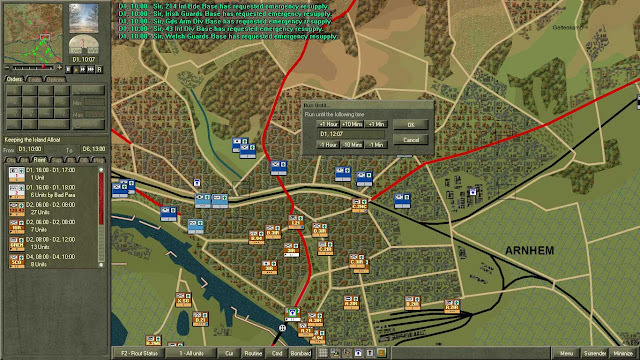 Traditional war games have abstracted command and control into very clever rules, yet for the most part the player can move and attack with his virtual troops in a God-like fashion. Command Ops is all about the friction of C2: orders get delayed, subordinate leaders making their own (sometimes undesirable) decisions and orders not followed for lack of time or resources. Market Garden was a colossal miscalculation in terms of what soldiers can achieve in the context of their combat power and standard operations procedures. The game will show you own miscalculations within minutes. This war game engine can run on almost any computer. Yet in the past, the size of scenarios were limited by the number of units and the size of the map the processors could handle. Now computers are more powerful, the engine has been tweaked to death and we can enjoy scenarios we could only dream of back in the days. 120 Km2 of fun. This was split in two scenarios back when Highway to the Reich was originally released. The game engine now features a timed assault option, which allows the player to coordinate assaults from two different formations carrying out two different attack orders. 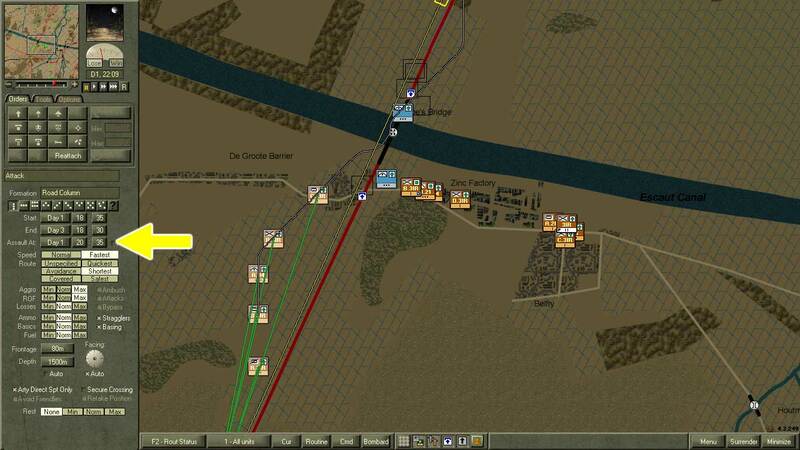 Two battalions from the Irish Guards Brigade are assaulting Joe's Bridge, from the south and the east, simultaneously. All thanks to the new "assault at" option (yellow arrow). Gone are the times where you could shrug and blame defeat on your units' lack of ammunition. 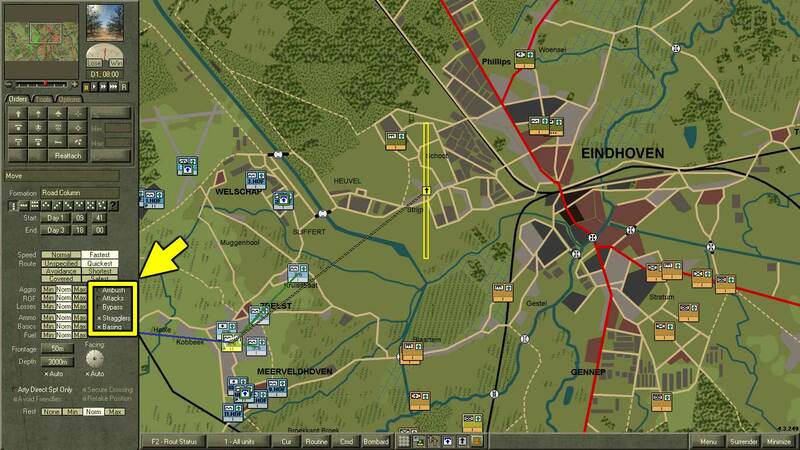 Now supply is more explicit and includes supply trains from bases to the front lines. So keep those lines of supply open! The supply tab (tab in the left) is just an inventory of what's available. With the new engine, you have to make sure the roads are open for those goods to be delivered. Big scenarios mean big formations. A new tab now features a clickeable OOB browser that allows an on-map review of your formations. 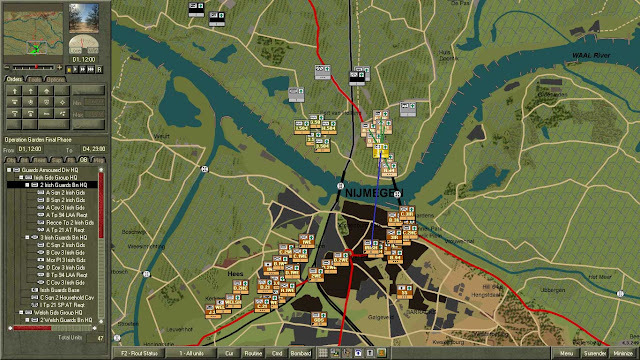 Plenty of Allied units and the bridgehead across the Waal river is nimble. One click on the tab's entry on the right selects and highlights the unit you are looking for (a battalion in this case). Ever planned an attack or tactical march and found out a couple of simulated hours later that your troops merrily took a "shortcut" that will take an additional five hours to complete? Not anymore. The path tool allows the player to visualize the best routes from point A to point B and how long is going to take. There are options for motorized and foot units. Also, the player can choose a formation and get the same data. That green line (look near the yellow arrow in the map) is the quickest path between two points for a motorized unit. That line of outposts, how much ground it covers, Captain? Gah! I'm incapable to read a relief map. Add vegetation and built-up areas and I am as good as lost. 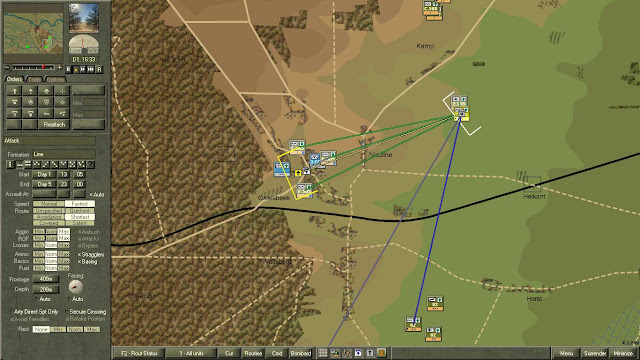 The engine now features a line of sight area which is indispensable for planning both defensive and offensive missions. 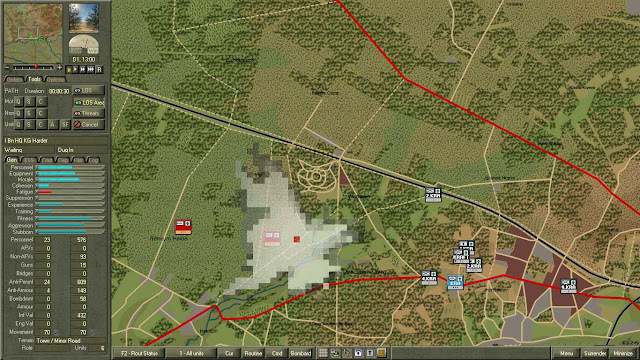 The line of sight area (white and grey squares) from any specific point (the red square in this case). As if juggling with a whole Corps worth of troops was not enough, the demands of the world outside the computer screen do not stop. That garbage can will not walk to the curb, that cold one will not fly to you from the beer fridge and that diaper of the bundle of joy will not change itself. Enter these new two tools in the game engine that will help your significant other to believe that you actually haven't moved out of the house. No need to watch over your troops. You gave them sensible orders, didn't you? Run the game for two hours while you do other things. 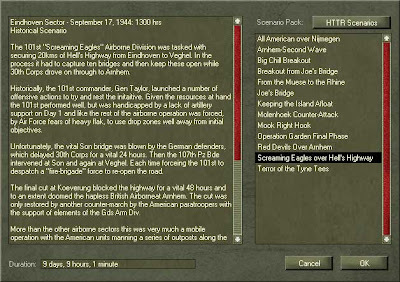 The message tab in the left can be clicked and the map will be centered on the unit or event that triggered the message. Once you embark a formation into a mission, it's good to tell them what to do in case something unexpected happens, like contact with the enemy or a unit falling behind schedule. This German battalion is about to start a short tactical march. With the lack of reconnaissance in the area of operations, it is good to have the option of telling them what to do in case they start contact with the enemy (bypass, attack, yellow rectangle) or to wait or not for stragglers. 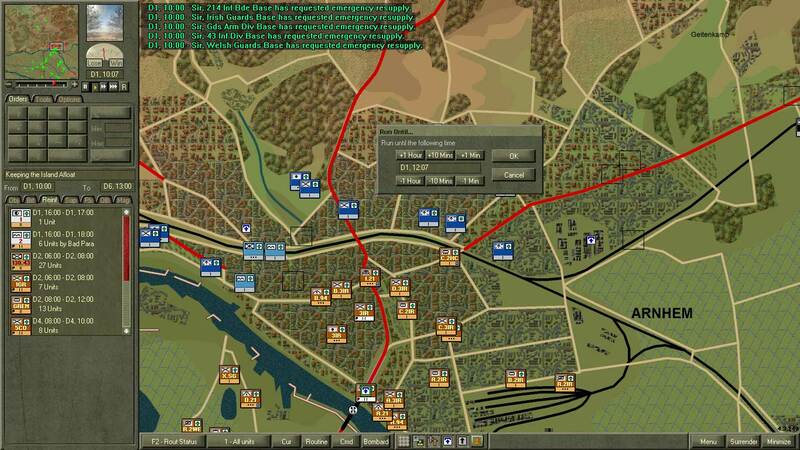 Battles from the Bulge is all good but you have to give it to me that the terrain is a maneuver constriction nightmare. In Highway to the Reich, the terrain is more open to a certain extent (there are more water bodies that are a restriction anyway). 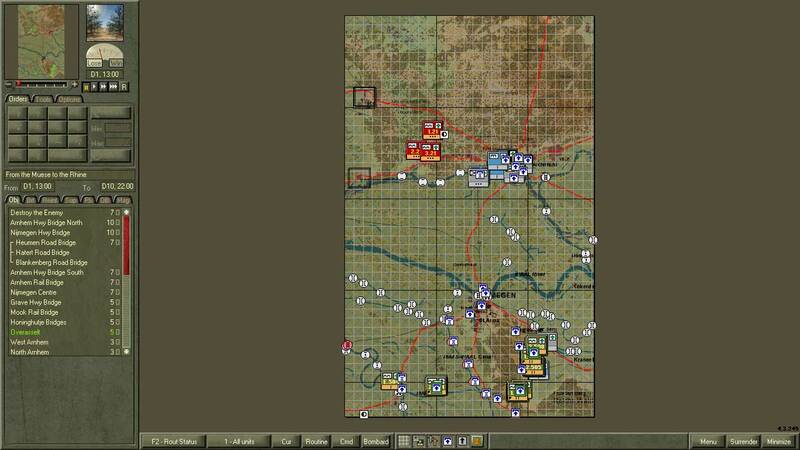 It is good to get back into wider battlefields, at least I now can remember old tricks I used in CotA. 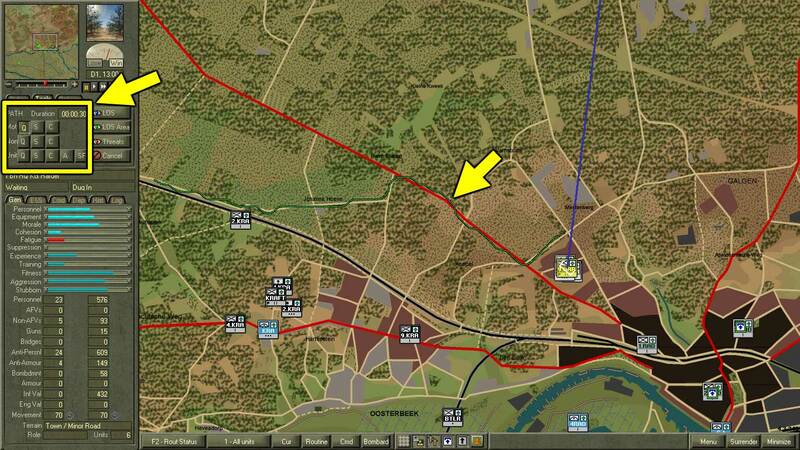 I ordered a parachute battalion (green icons) to attack on a wide front (yellow line shows frontage). 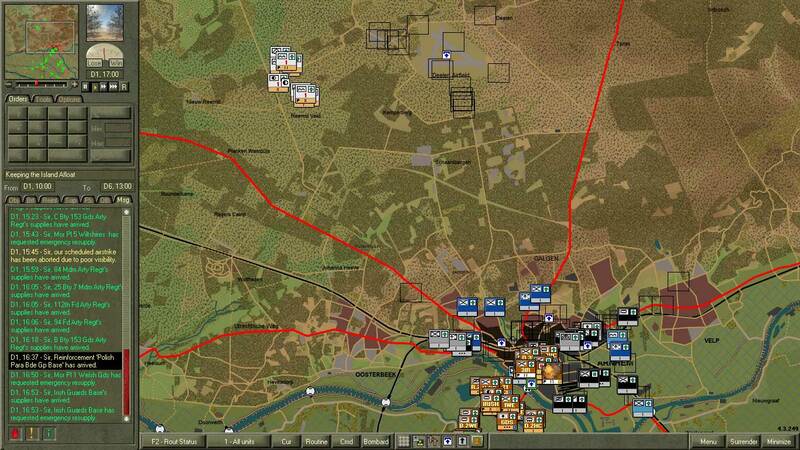 The two battalions companies on the north and south flank made good progress due to the lack of opposition. The battalion company in the center got stuck a few meters from the FUP. I clicked on the attack order icon (yellow tiny arrow in the center of the map) and narrowed the frontage to a minimum. The flank companies re-directed their assault towards the center of the village, all without having to issue another attack order for each company (that would cause a delay because the AI has to plan each attack from scratch). Surrounded, out-gunned and on a tight timetable. Does it get any worse? Let's not forget the particulars of airborne operations (a blog entry on that coming soon), how challenging they are and how much tactical wit a ground commander has to pull out when his superiors have thrown him under the tactical bus. 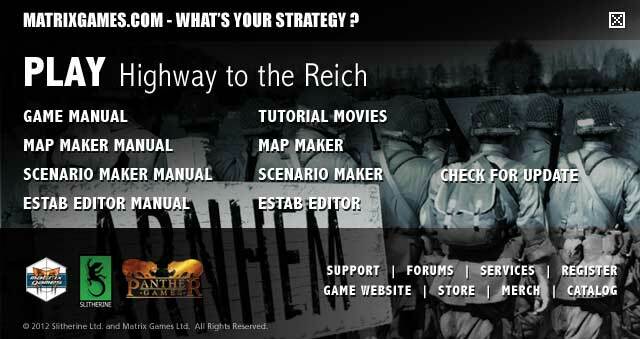 The Panther's game engine has changed significantly since the original Highway to the Reich. Revisiting Market Garden under the shining light of the new additions is well worth the price of admission. Great review. This is on my list for 2012. Hi Hadik and thanks for your comment. Added your blog to the blogroll here. If ever I would have more gaming/sim-time, this one would be number one for me. How does this game compare to Battle of the Bulge? I got that game but not Highway to the Reich. Is it the same engine wise (do both engines get updated that way) and only the combat scenario and scope is different? 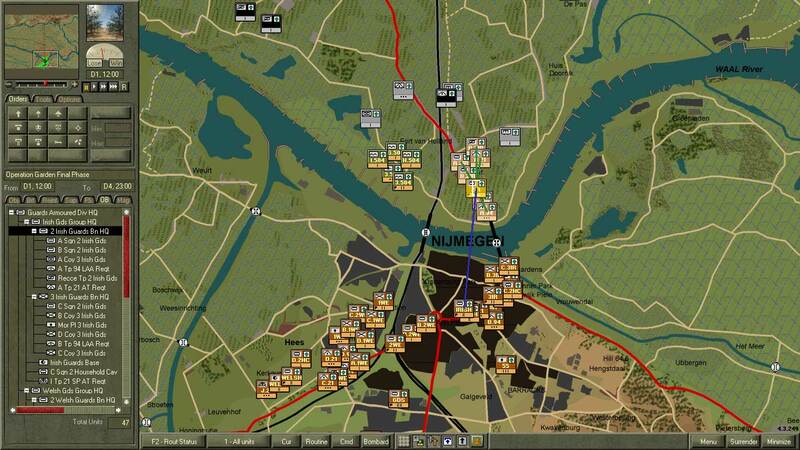 Command area development:your article is very interesting and good writing.